Ever since Kanye West and Kim Kadarshian got married in front of a wall filled with white peonies, roses and gardenias, flower walls have become a huge hit! Catching on as a big trend in Indian wedding décor, these living, perfumed backdrops are a wonderful way to create drama and ambience that works at all sensory levels. Flower walls can be used as reception backdrop, at your vedi mandap, as photo booth backdrop or just as a stand-alone accent wall. Match it to a color theme and do a monochromatic wall in single colored flowers, mix it up with an assortment of wildflowers and greens to create an English garden theme, or do an entire wall of marigolds or roses if you want to keep the décor classic and traditional. How you use the flowers will determine the tonality of your décor. When deciding to opt for fresh flower décor, ask your florist if she or he can execute this idea. Instead of spreading fresh flowers across the venue, a wall might have greater impact, delivering a more powerful punch. Go through our selection of flower wall ideas and find your own unique décor style. 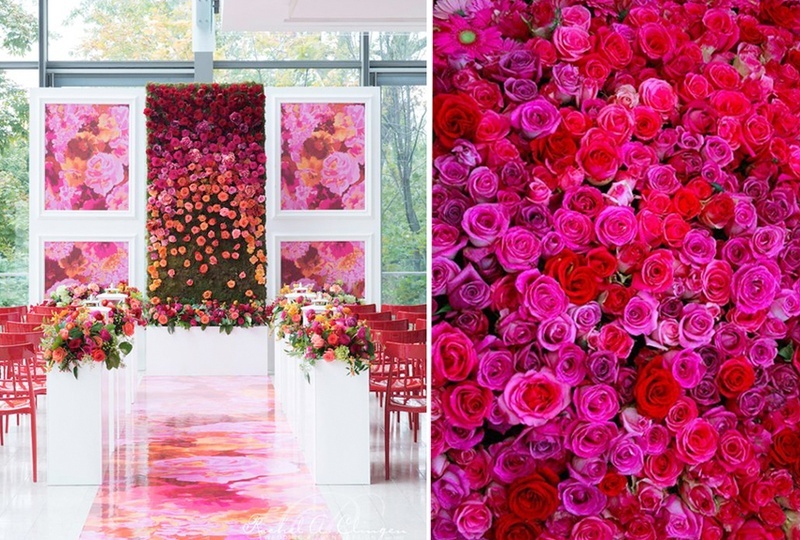 Replicate the look by showing your florist a picture and glam up your wedding with these stunning inspirations. Asin too, was not far behind to have a bed of roses be her flower wall on her auspicious day! We soon realized this trend has picked up like wild fire when we spotted many real brides and grooms incorporate this style into their wedding decoration. Now, we just can’t stop ourselves from crushing on them! Flower falls are a complete win-win and money-saver in decorations for weddings. They make a great backdrop for your wedding ceremony and can later be used as a backdrop for your stage décor and/or as a photobooth too. However, you decide to incorporate these beautiful flower decorations they’re sure to create stunning images! Keep scrolling for some fantabulous ideas and inspirations we’ve gathered specially for you! If you’ve reached till the end of this blog, we pretty much have guessed you love or possibly drool on flowers. So, here are more amazing ideas and inspirations on flower decorations in weddings that are creating a rage. Love Sunflowers? #SummerWeddingSeries – Fresh Ways To Use Sunflowers In Your Wedding Decor! Just in case you’re looking for something other than flowers: Stunning Wedding Decor Ideas without Flowers! Find much more on latest wedding party decoration trends here.